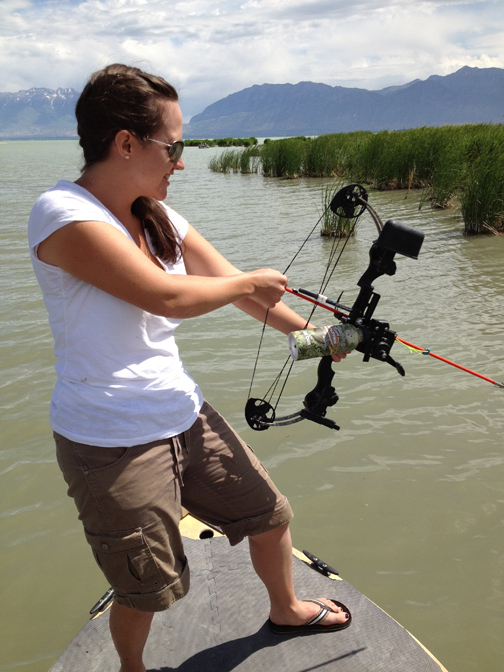 After a quick target practice on the lawn, they gave me a bow with a fishing reel hooked to it and put me on a boat. After missing the target more times than I care to mention, I didn’t expect a whole lot of success shooting at a moving fish. The carp like to come to the surface to spawn during the heat of the day. They flail around in the reeds by the shore. Our wonderful teacher, Jared, took his boat right into the reeds where you could hear thrashing on all sides. 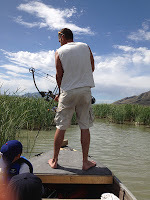 We’d whip our bows around to take a shot at the moving reeds but the fish would drop back below the surface. Silently, we moved through the water waiting for the next rustle. One started flailing in front of me. I pointed and shot off an arrow without really trying to aim and without being entirely sure my eyes were open. “You got it,” Jared said. My response was, “Are you sure?” I pulled my line in and sure enough there was a big old carp dragging on it. As I yanked it into the boat, it slipped off the arrow, leaving only a piece of itself behind. There went my picture. But now the hunt was on. My two nephews and my brother were there, too. Unfortunately, both my nephews are left-handed and the only left-handed bow they had was an adult size. The 11-year-old figured a way around this. When he had to shoot, he’d yell back to his 8-year-old brother, “Pull my arm back.” They made a good team. After my brother shot one, it was only a few minutes before I got a quick shot at another before the carp ducked down again, and I took it. Stuck the thing right through the head. I was only 1 for 10 at a target but 2 for 3 at a moving fish, which convinces me that I need to think less before I do something. For everyone concerned about the carp, I’ll tell you little about what we learned from the state’s biologist. 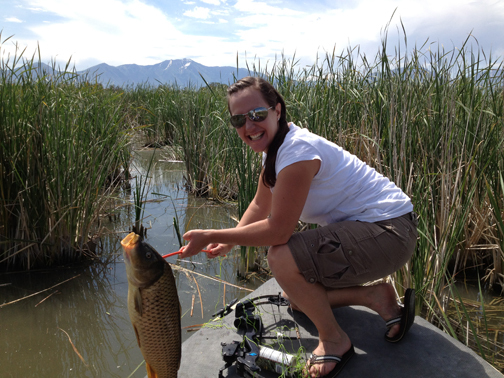 The carp were introduced to Utah Lake by the pioneers who wanted a prolific food source. Unfortunately, carp are very damaging to environments that aren’t their natural habitat. They are taking over the lake and forcing the extinction of the Utah Sucker fish, which is only found in Utah Lake. The carp also feed off the bottom, which destroys the vegetation giving the lake its muddy color. There is a huge effort underway to reduce the population and this is just a small part of it. Wow. That sounds like an awesome sport but it must be tough when the water is murky. Do you need a specific bow or can you adapt an existing compound bow with a reel? Yes, you can use an existing bow. The sporting goods stores have special reels that can be attached. As for murky water, you shoot the carp when they’re spawning. They come to the surface and flail around giving you a target.